Catania - Best of Sicily - Sightseeing, guest farms, agriturismo, hotels. Enjoy a delightful stay amid citrus groves on a charming farm near the coast just outside Catania, conveniently located near Taormina and Etna. Visit our site for details. Since the eighteenth century, Catania has been the second most important city of Sicily, supplanting Messina in that respect. Subjected to Etna's fickle temperament, Catania has been damaged by lava flows and earthquakes on several occasions. A particularly destructive volcanic eruption in 1669 was followed by a serious earthquake in 1693. Founded by the Siculi and colonized by Chalcidians (a Greek people) from Naxos in 729 BC, Catania was conquered by the Romans in AD 263, eventually becoming the most prosperous city in Roman Sicily. However, archeological evidence indicates man's presence in the area during the early Bronze Age (2200-1400 BC). By the Middle Ages, it was still an important port, though less prominent than Messina. It flourished until 1169, when it was almost completely destroyed by a particularly violent earthquake. Following this catastrophe, Catania was gradually rebuilt. The city has two Roman amphitheaters. The smaller one, off Via Vittorio Emanuele near Piazza San Francesco d'Assisi, was built upon an earlier Greek theater and is open to the public. It is said to have accommodated as many as 6,000 spectators. The nearby Odeum, a much smaller theatre, could hold about 1,300. A larger amphitheatre, closer to the commercial center in Piazza Stesicoro at the intersection of Via Etnea and Corso Sicilia, is a completely Roman structure built in the second century AD. The piazza, incidentally, is named for Stesichorus, a Greek poet who lived in Catania during the sixth century BC. Now located below ground level and usually closed, this vast complex probably seated about 14,000 spectators. Only a small part of is actually visible today. With its vast underground network of passages and alcoves, it is reminiscent of the Roman Colosseum. Ursino Castle, located in Piazza Federico di Svevia, at the end of Via Auteri between Via Plebiscito and Via Garibaldi, used to be a coastal fortress before volcanic eruptions extended the coastline. 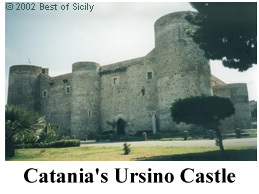 This castle was built by Richard de Lentina on the orders of Emperor Frederick II von Hohenstaufen in the first half of the thirteenth century and subsequently modernized in the manner of those at Messina, Taranto and Bari. It is now a museum open to the public. Though extensively rebuilt on Baroque and neo-classical models, the oldest part of the cathedral (duomo) was constructed in 1092. Several royal personages are entombed there, including Frederick III of Aragon (ruled 1296-1337) and Queen Constance, wife of Frederick IV (ruled 1355-1377). It was during the Aragonese period that Catania began to compete with Messina to become the most important city of eastern Sicily, and a point of reference for islanders from Castrogiovanni (Enna) eastward. Most of Catania's wide streets and majestic palaces were built during the eighteenth century, coincidental to the Bourbon's development of Naples, and the architectural similarity between the two cities is striking. That both were continually menaced by volcanic eruptions is a further similarity, though Etna is larger and more active than Vesuvius. An obvious difference will be seen in the gray volcanic stone used to construct the Catanian buildings; some visitors believe it gives the city an ominous face. Giovanni Verga and Vincenzo Bellini were Catanian (though Verga was actually born at Vizzini). Catania's best known citizen was Saint Agatha, its patroness, martyred here in the middle of the third century. It was during the eighteenth century reconstruction period that noble families from across eastern Sicily began to build palazzi in Catania. Thus began a social and economic rivalry with Palermo that continues to this day. One of the essential differences between the cities is that while Catania is somewhat more industrial, Palermo remains the administrative center of Sicily. Though it won't be readily apparent to the casual visitor, the two cities differ from one another in many subtle ways. Catania is certainly less chaotic than Palermo, and most streets and squares are a good bit cleaner. Its residents are generally more open, and organized crime, which certainly exists, is slightly less pervasive here than in Palermo. Most Sicilians, even Palermitans, would agree that it's generally easier to do business in Catania than in Palermo. For all its Baroque grandeur, the city is not frequented by the number of tourists who flock to Palermo, Syracuse and Taormina, most of whom just briefly pass through Catania on their way to Mount Etna or Syracuse. That's unfortunate because, like Messina, Catania has something to offer those willing to unveil its historic treasures. Even during a brief itinerary, this very special city is worth at least a morning or afternoon. For Visitors: If you're shopping for souvenirs, Taormina might be a better choice than Catania as it has a large number of shops concentrated on a few streets, though Catania offers Via Etnea. The city has a number of restaurants but they're not easy to find. Catania is certainly worth seeing – at least for a brief visit. The two large street markets are particularly interesting, and the churches and palaces have a distinctly Baroque aura. Catania is a good point for making connections to other places if you're traveling by train or bus. Buses for Etna, the airport, Palermo and various nearby towns depart from the piazzas near the train station (there are several different bus lines with offices off the main square). Fontanarossa Airport is only about 20 minutes from Catania. There are fairly frequent train departures for Taormina, Syracuse, Messina and the mainland.